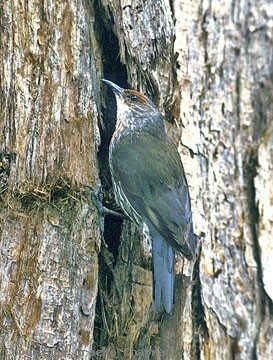 Red-browed Treecreepers inhabit the tall, humid eucalypt forests of coastal south-eastern Australia from near Gympie in Queensland through to the Dandenong Range near Melbourne. 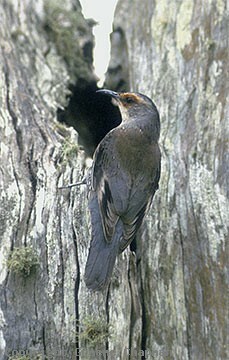 They live in pairs or family groups in permanent territories. Easily overlooked, they often occur side by side with White-throated Treecreepers and when foraging high up in the branches, their distinguishing marks are not always easy to make out. The Red-browed Treecreeper is one of our communal species - young ones remain in the territory for more than one year and assist the adults with nesting. 560201 ... Red-browed Treecreeper, adult female. 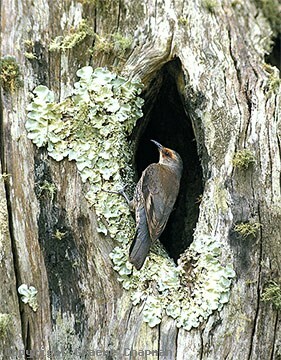 560202 ... Red-browed Treecreeper, adult male.